First, it’s Happy 17th Birthday Jonjo Shelvey; thanks for signing that birthday contract. May you continue to improve, and if you cannot play Premiership football with Charlton in the next couple of years, then at least we should be able to benefit from a decent transfer fee (not set by a tribunal). Jonjo’s next involvement with the first team squad comes with the visit to Welsh Wales, and a first visit to The Liberty Stadium in Swansea. It remains to be seen if manager Phil Parkinson starts Jonjo, now he is definitely committed to the club, rather than leaving him on the bench where he has been for most of the last month or so. The likelihood is that Parky will keep an unchanged side, especially as the team have won four points from the last two games, and not conceded a goal in the process. There are no reports of injuries from last weekend’s Barnsley game (where Parky didn’t use any substitutes), and the only changes may be to the bench where Deon Burton is available again after one game suspension, and Zheng Zhi could be recalled after another week’s training having recovered from injury. Rob Elliott is now firmly esconced between the posts, having seemingly won his battle for the goalkeepers jersey with Darren Randolph and Nicky Weaver. In the right place at the right time to take his chance, and having not conceded a goal for couple of weeks, Elliott should be full of confidence for this challenging match. The defence in front of the goalkeepers has seen plenty of changes this season, but at least now, we seem to have settled back four too; Graeme Murty, Mark Hudson, Darren Ward and Kelly Youga are the chosen ones and the record does suggest that they are good enough at this level. With Yassin Moutaouakil out of favour, and Jon Fortune and Jose Semedo injured, there really aren’t too many other options around at present either. That cannot be said in midfield though, even if the incumbent four are likely to play once more on Saturday. All of them – Tom Soares, Matt Spring, Nicky Bailey, and Therry Racon – have scored this year, and that goal threat is one good reason that the manager keeps picking them. Pushing all the way is another 2009 goalscorer – Shelvey – plus Lloyd Sam, Matt Holland (whose midfield appearances may be limited due to other options even if he can still do a job in defence), Josh Wright, Darren Ambrose (another 2009 scorer...), and the returning Zhi. It is good that goals have been coming from midfield as the forwards at the club have not been scoring recently. Chris Dickson has promised, but so far failed to deliver a league goal to go with his cup scores, even though he has been a breathe of fresh air in attack. Alongside him recently has been Tresor Kandol, who has goal pedigree with Leeds and Millwall this year, but he hasn’t really looked very close to scoring for the Addicks yet in his loan spell. Neither has Burton over recent weeks, and his penalty some time back is his only goal so far for the club. Svetislav Todorov filled a bench space last weekend, but the fact that he failed to get on the pitch while the game remained scoreless suggests he is not favoured by Parky, and the only other attacking option is Stuart Fleetwood, who has yet to make an appearance for Charlton. Subs from Randolph, Weaver, Moutaouakil, Holland, Basey, Shelvey, Sam, Wright, Ambrose, Zhi, Todorov, Burton, Fleetwood. Swansea are having a pretty good season for a club that was promoted last year; they are ninth, but have a very good home record with just one defeat. The good news is that they have a few injury problems, exacerbated by a tough midweek cup defeat at Fulham. Hopefully one or two of their team will be below par, and that could give the Addicks the edge that they crave. In saying that, a defeat would not be unexpected, and a point gained would be a point more than hoped for in reality. Pedro45 is happy to have seen some improvement consistency from the Charlton side over recent weeks, but thinks that to expect anything from this game is letting heart rule head – I forecast a 2-1 defeat. The recent clean sheets are great, but at some time we will concede, and we don’t have a great record of coming from behind this year to look back on with any confidence. I do hope I’m wrong however! My one-to-watch in this match is going to be Mark Hudson; our skipper opened the scoring against the Swans way back when the sun was shining in August at The Valley. He has come through a recent ankle problem, and will hopefully now be fit and free from suspension for the remaining dozen games after this one. His leadership qualities are desperately needed, even when others are natural leaders (Bailey, Holland, Murty…); hopefully he can lead us to a much needed win? The next week – which includes two winnable home games – will go a long way to defining if this season is a battle won or lost; whether it is Championship or league one next year; whether we need to chop another three million quid from the budget or not. Anything coming home from Wales will be a bonus. Fingers crossed eh?!? Like many others, I chose to listen to this game via CAFCTV, so cannot comment too discerningly about finer aspects of the match. Suffice to say that a draw was a little disappointing, especially as Charlton finished much the stronger of the two sides. Phil Parkinson chose, not surprisingly, to keep the same starting eleven that won against Plymouth the previous week, with Svetislav Todorov replacing the suspended Deon Burton on the bench. The online commentary was not the best, but a quiet first half was only enlivened by shots from Mifsud for Barnsley and Mark Hudson for the Addciks - Hudson’s shot being well saved. The second half initially saw Barnsley become stronger, with a couple of efforts going wide or straight at Rob Elliott in the Charlton goal, but then for the last 15 or 20 minutes, it was pretty much all Charlton. 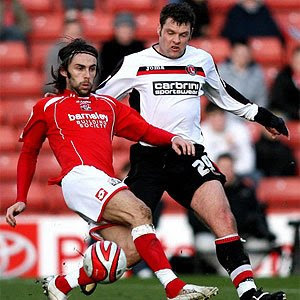 In this period, Therry Racon, Nicky Bailey, Chris Dickson, and Tresor Kandol all saw plenty of the ball according to the commentator (though he was getting some players mixed up regularly…), and all had efforts saved by Muller, Barnsley’s German keeper. It was rather strange that Parky chose not to make any substitutions (for the first time since he took over at The Valley), especially as he did have attacking options in the form of Todorov, Lloyd Sam and Jonjo Shelvey. However, as he rightly pointed out afterwards, all the midfield have scored for Charlton recently, and they do also fight in every match. Far too many times in the past we have seen un-necessary substitutions unbalance a team, so I have some understanding of what Parky was hoping to see as an outcome here. Sadly, the single point won may not be enough in this long season, especially as other results did not seem to fall as expected. My own opinion is that other results should not be looked at too closely, as it is up to the Addicks to win games, win points, and get themselves into a position where other teams results do not really matter. Although a game up at Oakwell does not seem on paper to usually be one of high magnitude, Saturday’s fixture which sees Charlton take on Barnsley is of utmost importance. Not only are Barnsley still desperate for points to ensure that they do not get dragged into a relegation battle, but Charlton have even more need if they wish to save themselves from the dreaded drop this season. Bottom of the table for several months, a win in this match could see the Addicks rise off the base, to the heady heights of 23rd in this league, if other results go as expected. Last weekend’s home victory must, we hope, have boosted the Charlton players and management, but it is a very long time since Charlton won back to back matches (Late 2007...). At least they do have a chance of doing so (as do Barnsley…after four previous consecutive defeats in 2009), and the team does now have a much more settled look about it, barring injuries and suspensions. In fact, Phil Parkinson has quite a few players from which to choose if he wished to switch things around, or shake things up, as unlikely as this may be. In goal, the likelihood is that home-grown Rob Elliott will continue, with Darren Randolph on the bench. Nicky Weaver did make his reserve team comeback in midweek, but it is not thought that he will figure in first team plans unless injuries strike. The defence will see no changes, with Graeme Murty likely to recover from a midweek slight calf strain to figure at right back, Kelly Youga on the left, and tall central defenders Mark Hudson and Darren Ward in the middle. Grant Basey will probably fill any defensive duties from the bench. 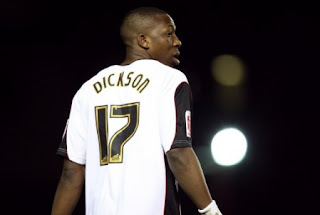 In attack, Deon Burton’s suspension means that Tresor Kandol and Chris Dickson should get the chance to develop their blossoming partnership that simply lacks goals. Burton’s bench place will be a straight choice between Svetislav Todorov (whom Parky hinted may be preferred…) and Stuart Fleetwood. That leaves the midfield, where the probability is that the four incumbents – Nicky Bailey, Tom Soares (who has had his loan from Stoke extended by another month), Matt Spring, and Therry Racon - will retain their places, but where a large number of options remain. Parkinson can also chose to play or simply fill the bench with any of Jonjo Shelvey (in his last possible Charlton outing as a sixteen year old, and where he made his debut last season), Darren Ambrose, Lloyd Sam, Josh Wright, and Matt Holland. I do think that Shelvey has been overly protected in recent matches, possibly to keep prying eyes away from him as he approaches his seventeenth birthday, and the offer(s) of professional contracts. Fans know that the club has offered Shelvey a lucrative initial pro-deal, but the rumours persist that he is being pursued by several Premiership clubs, and their financial might could be too much for Charlton to match. If it is, then Shelvey and his agent will need to consider where they should be playing football to best develop his undoubted talent; is it in the reserves in the north of England where Shelvey’s bald pate will be at its shiniest, or in a lower league with Charlton. My own wish, as with many other fans, is that he stays at The Valley, and moves on in a couple of years for a hefty fee if he improves as is thought (much as Lee Bowyer did…), but there are simply no guarantees. There is also a remote possibility that Zheng Zhi, China’s captain, who has made just a couple of appearances for the Addicks so far this season, may feature at some point at Oakwell, although personally I think he will be kept back another week. The danger here is that he takes a bench place, but then gets thrown in early in the game due to injury for instance when he is not ready for much more than 45 minutes or so… With Racon, Bailey, and Spring all doing well recently, there is no real rush to bring ZiZi back this early anyway. Subs from Randolph, Weaver, Moutaouakil, Basey, Holland, Shelvey, Wright, Ambrose, Sam, Zhi, Todorov, Fleetwood. Barnsley were very grateful for the midweek win, which took a bit of pressure off as it was their first since the turn of the year. They have pace up front in Michael Mifsud (on loan from Coventry) and ex-Addick Jamal Campbell-Ryce which will need containing, in much the same way that Plymouth had a couple of pacy players last week. They will know that a victory will pretty much allay any fears of going down, so should be up for the fight. They are also aware of how they demolished the Addicks in the first half at The Valley in October scoring three goals in a heady initial period without reply. That day saw Barnsley win away for the first time in a long time, and they will be hoping to complete a comfortable double. 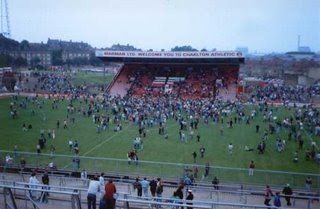 In my opinion, that was the lowest point of this Charlton season; a day that saw us wimper to defeat. For Charlton, this is simply a must not lose game; I’m not of the opinion that a draw or a defeat will signal the end of this spell in the Championship, but as others have mentioned, games are running out. The necessity is for three points, and I hope that Parky has his squad very aware of what is required in this game and going forwards. Performances have improved vastly over recent weeks, especially at The Valley, but that hoodoo of eight consecutive away defeats now needs snapping. My one-to-watch in this match is gong to be the flamboyant Chris Dickson. He hasn’t scored a league goal yet, but his recent performances have wowed the crowd (if not always Mark Kinsella…); all he is short of is a goal to kick-start things and then who knows what might happen with that sort of confidence blast! He has good skill, is quick, and can be more of a team player than one or two think; his partnership with Kandol is coming along nicely with every game, so I’m hoping this could be the breakthrough match he needs. A well deserved, thoroughly comprehensive, second consecutive home win for Charlton, against a very poor Plymouth team who are in real danger of being dragged into the relegation dogfight. The goals came from midfielders Therry Racon – my one-to-watch (left, with Mark Kinsella after scoring) – and Nicky Bailey in each half, and the Valentine's Day love poured out to them both from fans in the crowd. 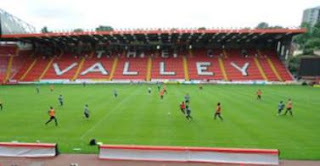 Charlton started with just two changes, to defence, where Mark Hudson and Kelly Youga expectedly returned in place of Matt Holland and Grant Basey, and Bailey lined up on the left side of midfield. The initial skirmishes saw Plymouth waste a decent early chance and saw plenty of long high balls played forward without much accuracy from both teams. It took time for both sides to settle, but then midway through the half, the Addicks started to look dangerous. Chris Dickson had a couple of shots, and Tresor Kandol also fluffed a chance. The first goal came after 32 minutes when Tom Soares took on one defender, but seemed to have taken the ball too far when it clipped the second defenders instep to win a corner on the right; this was disputed and the linesman did take time to confirm the correct decision. While arguments went on, Soares took the corner short to Matt Spring but his low cross was blocked out to the edge of the area. Racon went to shoot right footed, but dummied, bringing the ball onto his left side where he had more time. The Frenchman used it to brilliant effect and curled a lovely shot into the top far corner with the 'keeper left flailing. It was great to see a new goal celebration at The Valley, led by Racon near the corner flag, though some of the teams dancing left a little to be desired! Immediately though, Plymouth almost equalised with a free kick from the edge of the area which hit the bar. As it came out and was crossed in again, Rob Elliott had to make a very good save to flick the ball off an attackers head at the far post conceding a corner. Charlton continued to look the better of two average teams, and hung on quite easily until half time. The start of the second half was frantic, with Charlton having three penalty appeals for handball in the first three minutes of this period. The third (and by no means the loudest shout…) was given by pernickety referee Kettle, and supporters rose to see the rarity of Charlton going two goal in front. Bailey shot well, but straight, and ‘keeper Larrieu saved with an outstretched arm, and the ball was scrambled clear. The concern was that this miss might let Plymouth back into the match, but Charlton forged forwards, and several attacks only failed due to poor finishing. Bailey himself could have made immediate amends but shot well over, and Spring volleyed high too. Dickson, who improved immensely as the game wore on, broke superbly down the right, cut inside, but when he should really have laid the ball back, he chose to shoot from a narrow angle and the ‘keeper punched clear. Kandol had a similar shot from the other side that was also well saved. Bailey then made his mark with a well taken goal from a Racon pass inside the full back. Bailey controlled with his body which took the ball wide of the ‘keeper and stroked into an empty net for 2-0. The crowd were now happy, and with 20 minutes left, it was a question of whether Charlton could hold onto their lead, clean sheet, and nerve, or improve their goal difference against this disinterested side. Plymouth Substitute Steve MacLean had a slight altercation with Kelly Youga, when he failed to move away when Youga tried to take a throw in; words were exchanged, and McLean then got plenty of thanks for his input from those fans sitting near the dug-out in the west stand. Youga had taken about five foul-throws before he was pulled up by the inept linesman/referee, so maybe MacLean was just reminding him to keep his back leg down? 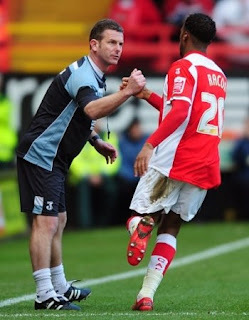 More chances came and went, and with ten minutes left, Phil Parkinson called off the chase and replaced the booked Dickson (left) with Deon Burton, thereby shutting up shop. Burton and Soares still managed to get booked in injury time, but the three points were won. I thought that the defence looked fairly comfortable throughout, only really looking like conceding when Kandol’s awful back pass gave Fallon a late opening, but he chose to fall over and claim a penalty rather than shoot. 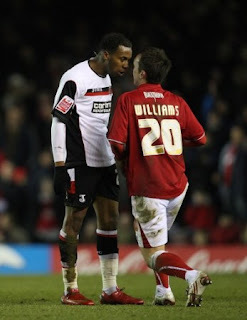 Darren Ward and Hudson looked comfortable in each others company, as you would expect, and it was good to see Ward explaining deep into the second half some defensive duty points in a mild-mannered way to Bailey when others may have been more confrontational. The midfield seemed comfortable without being exceptional; with so much high ball being played by both defences, there was a danger in the first half especially that crooked neck might be an injury concern this week for some of the team. Racon tried to get the ball down and play, but any continued passing coherence was rare. Up front, Kandol and Dickson’s partnership improved as the game wore on, and Dickson’s pace and skill exposed a poor Argyle side time after time. For once, the other results seem to have fallen for the club, and Charlton now find themselves only three points from being off the bottom of the league. This win does not mean that the team should think that climbing out of the relegation zone will be easy; it will not, and every winnable game from now in, just like this one, must be won. Next week, the side travel to Barnsley, who like Plymouth are also in poor form, and sit just one place above the bottom three. This is yet another opportunity to close the gap on the rest of the division, and a chance that must also be taken. The confidence exuded by the experienced team on show was welcome, and provided they play in similar fashion, could see the Addicks climb up a place next weekend. Let’s hope so! It does seem like an age since we saw Charlton beat our near neighbours, and hopefully tomorrow will bring about the same sort of result for the love of my life. Plymouth will come to The Valley without a win in 2009, and hopefully they will leave still wanting. This is all presuming of course that the Charlton pitch is up to scratch, following last weekend’s postponement due to snow and forecast frost. I hope that groundsman Paddy Powell is confident of a decent playing surface, and certainly an outfield better than the one in Antigua where England’s cricketers have found themselves beached inland. The weather forecast appears to be better than it has been so we should be confident of the match taking place. Phil Parkinson has another job on his hands picking the team he wants to start the game; he now has pretty much everyone who has been injured fit once more, and no suspensions to worry about either. Captain Mark Hudson has now recovered from his ankle problems we are told and Therry Racon (top pic) is now fit again after knee issues and has had match practice to get him up to speed. Racon may not be able to play two games in a week, but as he has had over ten days rest since the Bristol City away game where he revelled, he should be OK. Goalkeeper Nicky Weaver has also recovered from his bump on the hip that he got early in December at Blackpool, so he is in contention too. Kelly Youga is also available after his one-match ban. That just leaves Zheng Zhi of the injured players to get himself fully fit as Andy Gray and Jon Fortune are both out for the rest of the season. I would expect Parky to retain Rob Elliott in goal, even though Weaver is available, and Darren Randolph has done nothing wrong since the turn of the year. While Weaver may arguably be the better ‘keeper than Elliott (and is certainly paid more...), he was going through a terrible patch just before he got injured, and could directly be blamed for some of the goals conceded. Elliott has also had his moments, but has also made a few very good saves, and he should therefore keep his jersey. At the back, Graeme Murty has had his loan spell extended for a second month, and he will be hoping to get through 90 minutes without picking up some sort of painful injury; kicks on the shin, a dislocated thumb, and an ankle knock have left him bruised and battered in his first month with Charlton, but his heart is still fine and I expect him to start ahead of Yassin Moutaouakil, the only other viable right back at the club. If Hudson returns to central defence, as expected, then that will mean he will play with loanee Darren Ward (making his home debut), with Matt Holland making way. Ward has been a rock in his two away games so far, and will probably be happier knowing he has a “proper” defender alongside him, Holland has done his best, and filled a gap in his own imitable way, but this was always a semi-desperate measure. The left back issue is whether Youga comes straight back in or if Grant Basey retains his place? I think that Parky has made known his choice in this slot and that the Frenchman is his preferred option. In midfield, both Basey and Holland will be hoping for a start, or at least a place on the bench, but with plenty of other midfield options, both could be out of luck. Tom Soares scored in his last game, so he will be retained on one wing, while Nicky Bailey, Matt Spring (who scored in the last home game) and Racon (left) will all be hoping to play from the beginning. Lloyd Sam may relegate (sorry to use that word…) one of these central players if Parky wants a slightly more attacking option. I looks doubtful that Darren Ambrose, Jonjo Shelvey – who has had a slight hip injury – or Josh Wright will make the starting eleven. Up front, it is a perm any two from three, presuming the 4-4-2 formation is utilised, as Tresor Kandol (looking for his home debut), Deon Burton, and Chris Dickson all vie to bang in the goals (hopefully). My inclination would be to start Dickson and Kandol (as they did at Ashton Gate) with Burton in reserve. Subs from Randolph, Weaver, Moutaouakil, Basey, Holland, Shelvey, Wright, Spring, Ambrose, Burton, Todorov. Plymouth are in freefall at present, and also have plenty of injury problems (mainly in defence). They were sitting just behind the play-off places earlier in the season, when Charlton scraped and scrapped to a 2-2 draw at Home Park, but are now down to 17th place after their recent poor run. They do still have a decent looking away record, and have drawn their last two away games, but last weeks home defeat (a 3-0 thumping from an average Derby team ) has left them short of confidence. I’m pretty sure they will set up 4-5-1 and hope to counter attack, and then sit back and soak up pressure if they get the lead at any stage. Charlton have been in front at half-time in their last three matches, yet have only come away with three points; what we all need to see is this initial period form being continued for the whole match. It may be a fitness issue (which we know Parky has worked on since taking charge), and it is obviously a confidence issue (which the clubs psychiatrist will hopefully have countered? ), but whatever it is it needs to be cracked and soon. Pedro45 is worried about over-confidence creeping in, mainly to supporters who see this as a game that we can win after playing in away games where we didn’t really expect to get results. As long as the players do what is expected, and the crowd do not get too tense if goals don’t come early, then I too hope to see the next win we all crave – Pedro45 is forecasting a 3-1 victory. I do feel that if we can get in front, and then get that oh-so-important second goal too, then we should run out comfortable winners. My one-to-watch in this game is going to be Therry Racon (surpise surprise, left). This Frenchman hasn’t had much playing time at The Valley so far in his Addicks career (possibly only a hundred minutes or so? ), with all his recent games being away from home - I missed the Swansea game in August so didn’t see him start that match – and I’m guessing that many other fans have not seen much of him either. 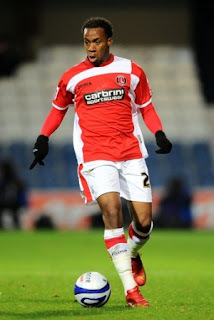 He has skill, stamina, and is not afraid to tackle, and if he puts all these attributes to good use, he can be a very good player for Charlton. I’m picking him to be the stand-out player tomorrow, and lead us to taking the spoils. Being where we are, which is ten-points shy of everyone else at the bottom of the league, we are in a position where we have to take every opportunity that comes our way; sometimes, you get a run of playing tams when they are in form, and we’ve seen plenty of those runs over recent times. Tomorrow is a chance to play a club when they are struggling too, so we must push home our advantage. Charlton as a club will (mentally) receive many, many Valentine’s Cards tomorrow, and I hope that the players reciprocate that love and send us fans home happy. We know that the players aren’t going to send us an unsigned card, but that doesn’t have to mean the feelings are unrequited. 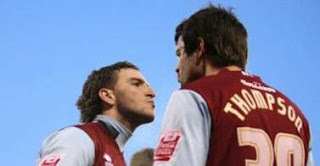 A few goals, three points, and the smiles of love leaving The Valley will return to faces, courtesy of ther players. Let’s hope so, eh? One of the problems with not working at present, and with my wife also be unemployed, is that to fill some time this week we have been doing spring cleaning. This is not the kind of cleaning where we get the hoover and duster out and zip round the house, but a full blown "let’s sort out this cupboard out and put stuff in the loft so that we can decorate" type of spring cleaning. I hate it, but it has to be done. Yesterday we shifted clothes out of the cupboard, moved my bagged up LP’s so they can be ready to go up in the loft, and brought down all the stuff in the loft that was not "organised" as my wife wanted. This included all my Charlton programmes from the last forty plus years. You see, about fifteen years ago, when I was single and lived in my one-bedroom second floor flat, I stored my programmes in various bags (plastic, then inside sports bags or the like...) and kept them in a cupboard. I didn’t have a problem until my girlfriend (and later wife) moved in with me and then we had the usual space problems when two people fit into one persons home. The outcome was that I decided to utilise the basement storage area that the whole block of flats could use. Suitably bagged (including six years being forced into my wife’s large rucksack), I hauled the programmes (and some other stuff to be fair...) down to the basement and sort of hid them round the back of some furniture that someone else had placed down there. I was slightly worried about them being stolen, but shouldn’t really have been concerned. All was fine; I remember checking they were OK a couple of times over the next couple of years or so, and then one day, the next time I checked, in the late nineties, I found that the basement had flooded. I have no idea if this was caused by any abnormal wet weather we may have had, or if a pipe had burst or leaked, but the floor was about an inch or two deep in murky water. I immediately shifted the bags containing the programmes so that they were no longer sitting in the pool of water but the bottom of the rucksack was damp, as were some of the other bags too. I must admit that I was a little distraught by this catastrophe, and could not bring myself to look inside the various bags in case I realised the damage. Today, after getting them down, I had to check them, mainly so that we could label each bag and repack them "tidily" for my wife’s pleasure. The good news was that sorting out the other dry programmes and looking through them when I got the chance brought back some fantastic and wonderful memories of times gone past - and yes, we have had plenty of good years during the last 42 seasons since I started attending The Valley. It was easy to reminisce about the play off final at Wembley in 1998, but also interesting to see the St Andrew’s programme of 1987 (which was almost as stressful and in some ways more! ), plus the Battle of Stamford Bridge programme from 1988, all of which resulted in positive results for the Addicks. Then there was the Carlisle away programme from 1981, and that from 1986 – both games which won Charlton promotion. I remember the 1986 trip vividly (May 3rd), as, arriving back at Euston around midnight, the taxi driver told me of the problems over in Wapping that night with Maggie’s marvels getting a pasting outside Murdoch’s castle. Cup tie programmes against Arsenal, Fulham, Harlow, Watford, and Ipswich sat next to testimonial game programmes versus West Ham, Chelsea, and Arsenal. I also had a few programmes from non-Charlton games I went to as a youngster – West Ham versus Middlesboro (Derek Hales Hammers debut) from ‘78; Chelsea vs Coventry in 1971; Chelsea vs Spurs in 1970; plus the first game of “organised” football I ever saw live – Kings Lynn versus Wellington in 1967 (1-2, all the goals in the first eight minutes!). I also had international programmes – England vs Turkey and England vs Austria (the only two times I have seen England play football live). But I also had others from games I hadn’t been to including the 1966 World Cup tournament souvenir programme, plus the England vs Hungary programme (plus ticket stub) from 1953 which my Uncle Sid gave me when I was young. That was the famous 6-3 game which signalled the end of the belief that England were the best team in the world (no change there then!). They are all suitably tidied up, re-bagged, and placed inside a couple of big boxes up in the loft now; I’m sure that when we next come to sort them out (when we move or when I die, whichever comes first...) then we’ll get a lot more pleasure from re-calling the days when being an Addick made me happy, just as it does today. With the weekend game against Cardiff cancelled due to the weather, thoughts have turned to how the club are doing in these poor economic times, and also the demise of an ex-Charlton Chairman. There does seem to have been plenty of rumour going around that one of the second division clubs threatened with relegation are about to go into administration. Bookies favourites are Southampton, but there has also been lots of speculation that it could be Charlton who suffer the ten-point drop that receivership brings. 2. I believe that most of the other £6m is simply outstanding mortgage payments for the building of the North Stand that are not due to be paid off very soon. If the above is correct, and I think it pretty much is, then why would the current Board, who have each invested huge chunks of money into the club wave goodbye to these sums, which is surely what would happen if the club did go into administration? If the Company did go down this route, there is absolutely no guarantee that they can do what Ken Bates did at Leeds and buy the club back for a pittance; it would be a very dangerous game to play with their own money but leave little in the way of benefit! Sure, HSBC - the club's bank - have withdrawn any overdraft facility, but I would suspect that they have done that to many Company's in similar circumstances over recent months and weeks. This merely prevents them being a creditor of the club in future, and bearing in mind the mess that most banks have made in investments recently, that is no surprise. The dreaded "A" word was mentioned at the recent AGM, but Richard Murray said that there were no plans for the club to do so, although he hoped some of our competitors might! I do think that the rumours going around relate to another club, and that the fact that Murray has come out and told the media that Charlton are doing OK merely compounds this fact and points the journo's in another direction for their speculating. The other Chairman news is that Michael Gliksten died last week. Gliksten was Charlton chairman between 1962 (when he became the youngest chairman in the Football League) and 1982, when he sold the football club to Mark Hulyer. The rights and wrongs of what happened after that are well documented, but this action was the start of a slippery slope that nearly saw the club die. I only met Gliksten twice - once on the train coming back from Carlisle following promotion in May 1981, where he seemed very happy and content to share the champagne with the rest of the team and staff. I also then met him soon afterwards at what I think was the first club open day at The Valley, probably in August 1981. By then, Mike Bailey had left for Brighton and Alan Mullery had passed him on the A23 to become Charlton manager. The open day was a quite strange affair, with no real comparison to those that take place today I think - it was very disorganised. We did have the training session on the pitch, conducted by Mullery, and with the injured Phil Warman providing witty commentary I seem to remember. I also toured the treatment room (where Charlie Hall had to go to great lengths to explain the benefits to one fan of the ultra-violet lamp on show - Q: "...so does it cure the players injury?" A: "Er, no, they just feel better and get a tan! "), and I went into the wooden-walled board room, where Mr Gliksten was entertaining. Gliksten seemed shy, but proud of the club he was in charge of, and he answered any questions posed. He seemed a little surprised at how many fans took time to come into the room to speak with him, and how much affection these fans had for "his" club. It may have been this open day which proved to him that the club was valued very highly by the supporters, and that may have led to him selling to Hulyer a year later in a belief that he could take the club onwards and upwards in a way that Gliksten never could for whatever reason (Hulyer certainly had big ideas!). The problem was that Hulyer couldn't afford to buy the ground as well as the club but did buy Allan Simonsen, and then he went bust, and everything went pear-shaped. Maybe if Gliksten had stayed on, we would have a very different club to support? 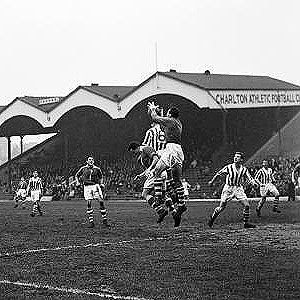 The Gliksten family are a major part of Charlton history, having provided three Chairman over fifty-odd years. As we well know today, there are good Chairman and bad Chairman - I think Michael Gliksten was somewhere in the middle. However, bearing in mind the current injury situation – with Mark Hudson still doubtful, Zheng Zhi only just returning to training, and Jose Semedo still a month away from playing again at least – this postponement is no bad thing for the club. I think an effort will be made to have the game re-scheduled within three weeks (which was always the line with Premiership matches that were called off…), but it is not always so easy to fit games in during that period in the Championship, especially as Cardiff are still in the FA Cup (after their 4th round replay was postponed in midweek versus Arsenal). Suffice to say that Charlton will probably be keen to put the game back to as late in the season as they can in an effort to play the match when they have some decent form (if that is ever going to be possible again? )… The club are saying that the game will be fitted in later in the season, but no specific dates have yet been mentioned. 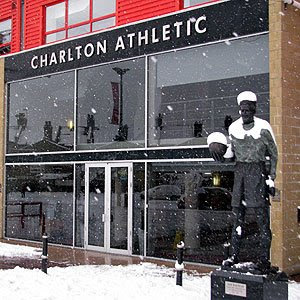 With this game being called off, Charlton have to wait until next Saturday for a match (provided that the snow and ice has disappeared by then…), and that is the very winnable (fingers crossed) one against an average Plymouth Argyle team that was nearly beaten at Home Park earlier in the season. In some ways, you could lift any match report for this game pretty much from that of the similar result at Burnley on Saturday; one up at half-time, Charlton fell under pressure to not only hold onto their precarious lead, but to gain any points at all. This time, City’s two second half goals came soon after half-time (unlike at Burnley, where at least the team hung on till the last quarter of an hour), both courtesy of Dele Adebola. It does seem that Matt Holland was unable to cope with Adebola’s strength in the air, but I guess that is to be expected from a make-shift centre back. Tom Soares scored the Addicks goal, heading home a Nicky Bailey cross. The positive news, which is what Phil Parkinson will no doubt be using, is that Therry Racon played well (until being sacrificed to save him from tiredness and also as he had already been booked). Darren Ward also had another solid game at centre back, and coped again with huge amounts of pressure, and Chris Dickson again impressed up front. The negative aspects are that one or two players got very bad press from the radio commentary, particularly Yassin Moutaouakil (for giving up on a ball), Lloyd Sam (for not chasing back) and Darren Ambrose (for arguing unnecessarily). Personally, although last week’s victory was very important, I did not feel that Charlton would gather any points from these two away games, so for me, the position is the same. What must happen though is that the improved Valley performances must continue, and that has to mean that we do not lose to Cardiff at home on Saturday, provided the game does go ahead (which it may not if more snow arrives as expected on Friday). Charlton have a chance to win something after all this season, with Nicky Bailey’s rocket volley against Wolves back in September in contention to win the Football League Goal of 2008. The volley flew toward goal in just the third minute of the game, and although goalkeeper Henderson got a hand to it, he could not keep it out, such was the force of the shot. 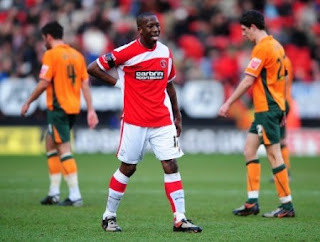 The goal gave Charlton the lead, but a second half comeback saw the Addicks beaten by the current league leaders. Charlton do have another part in the competition – the Mitre Goal of the Year - as Sylvan Ebanks-Blake’s goal for Wolves last season at The Valley is also one of the 20-gaols in contention. That goal saw Ebanks-Blake outpace Paddy McCarthy to win the ball, before cutting past him on the bye line and firing past Nicky Weaver. McCarthy himself even gets into the competition, with his hopeful punt from 40 yards flying past the Derby keeper earlier this season, but we won’t be voting for him will we. It’s tough to blog about games like this; games where we do all we can to win pints but succumb to the decisive goal well into injury time (and not for the first time this season either!). It seems that we do have a somewhat familiar story, in that Charlton played well in the first half, and held the lead at the interval, but painfully inevitably, goals were conceded in a one sided last 45 minutes. Nicky Bailey scored the Charlton goal – his sixth for the Addicks this season – in the 43rd minute, stroking home after good wing play by Tom Soares. 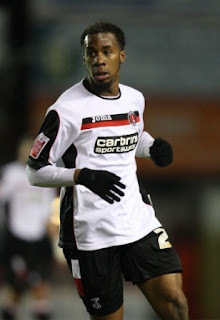 Charlton had started in a 4-4-2 formation, with Chris Dickson getting his first Charlton start. Also playing for the first time was recent loan signing Darren Ward, who had a mega baptism trying to keep the Claret hordes at bay during the second period. Matt Holland played alongside Ward in central defence (and also had a decent game by all accounts), and Graeme Murty was just about fit enough to play at right back. The rest of the team were as expected. It was Burnley substitute Steven Thompson who equalised with just fourteen minutes left, and he also knocked in a similar winner – turning home at the far post – well past the ninety minute mark. It was tough luck on Rob Elliott in goal, who had performed first half miracles in keeping the Addicks in the match. Sadly, losses like this are not good enough in Charlton’s fight to stay in this division, and only get compounded when any of those directly above the Addicks do gain points, as was the case.